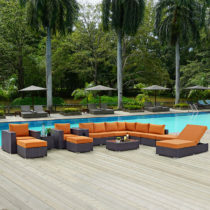 The Chestnut Contemporary Leather Sectional Sofa is a multi-faceted, stylish, and incredibly comfortable piece of furniture that possesses a universal appeal. Elegantly designed and carefully crafted, it is clad in genuine leather with soft cushioning to achieve both luxury and relaxation. The set can be rearranged to many formations to fit any shape of a living room. Gracefully accented steel trim gives it a unique appearance while its adjustable headrests offer many options of soothing relief after a long day of work. Top Quality Leather Sectional at an outstanding price!! !